One of the key takeaways from Hurricane Irma was a reminder about the importance of keeping trees properly trimmed in order to avoid damage to power lines from downed foliage. However, a recent report by Channel 7 News (Fox) in South Florida about a Hallandale Beach HOA’s troubles with the city over its allegedly exorbitant tree trimming serves as a cautionary tale for all Florida community associations. According to the report, the insurance company for the Hallandale Village Homeowners Association asked association president Richard Masone to trim the trees around the property at the start of this year’s hurricane season. Masone complied and asked the association’s regular landscape maintenance company to trim the trees. The association was told by the city that the trees were “hatracked,” or over-trimmed, and they ordered the community to dig up and replace the trees, which entails hiring an arborist and pulling permits for each of the 10-15 trees that would need to be replaced. Masone indicates in the station’s report that this has been a learning experience, and the association’s attorney has written to the landscaping company seeking its cooperation. He hopes that the company, which is licensed by Broward Country, will replace the trees, and notes that its representatives had indicated that they knew the proper way to do the job. The company did not return Masone’s calls, but it will need to take part in the investigation that Broward County officials have indicated they intend to open after they receive an affidavit from the city of Hallandale Beach. 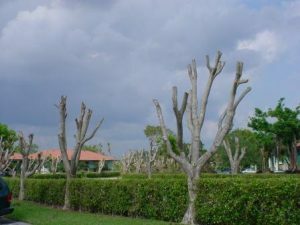 As the association president indicates in the news report, this has been a learning experience for his HOA, and it certainly also offers an important lesson for all Florida community associations that are planning to have their trees trimmed. Many local municipalities keep a watchful eye for excessive tree trimming that detracts from the verdant aesthetics of their neighborhoods. Associations should work exclusively with licensed and insured landscaping companies, and they should consult with experienced legal counsel to help ensure that they are properly indemnified from liability resulting from excessive trimming under their contracts with these vendors. Click here to watch the report from WSVN.